A pioneering entrepreneur with a far-sighted vision of the future, Dr. Stya Paul was instrumental in the rise of the Apeejay Group as one of the biggest industrial houses of independent India and was a leading architect of the country’s emergence as a selfreliant industrial superpower. 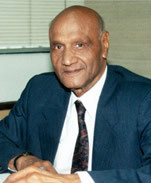 As Chairman Emeritus, he guided the Apeejay Stya Group, a privately and closely-held leading Indian Industrial and Investment House, to become one of the major corporate houses of the country, with several alliances, collaborations and significant presence in Europe, Middle East and East Asia. The year 2010 also saw the realization of Dr. Stya Paul’s lifetime dream of setting up the Apeejay Stya University – a seat of global learning established to bring about transformation of society through value-based education, man-making and nation-building. His vision of excellence for the University is being carried forward by his daughter and only child, Mrs. Sushma Paul Berlia, the Co-Founder and Chancellor of the Apeejay Stya University, Chairman, Apeejay Education Society and President, Apeejay Stya & Svrán Group. During his long and illustrious career, Dr. Stya Paul was actively associated with several social, cultural and professional bodies and held responsible positions reflecting his versatility, leadership and standing in industry and social circles. His philanthropy and generosity knew no bounds, and throughout his life, he helped the physically-handicapped and the needy with financial assistance and educational/vocational opportunities, thus enabling them to join the mainstream. Over the years, numerous awards and accolades were bestowed upon him, in a life richly lived and full of sharing & caring.